Operation Northern Shield, in which the IDF uncovered and destroyed 6 Hezbollah tunnels from Lebanon into Israel, was declared a success by the IDF a few days ago, although some people felt it was a premature announcement. But success or not, the Iranians in Syria are not going to let a good opportunity go to waste and launched a missile at the civilian area of the Golan Heights – constituting a war crime by any standards. IDF fighter jets struck Iranian and Syrian military targets, air defense batteries and Quds Forces positions throughout Syria in the predawn hours of Monday, in response to the firing of a missile a day earlier toward the Golan Heights. The IDF said that the missile had been fired by Iranian forces in Syria with the intention of hitting the northern Golan. The missile was intercepted by the Iron Dome. The IDF attack targeted military targets belonging to Iran’s Quds Force in Syria, including weapons storage sites, a site at Damascus International Airport, an Iranian intelligence site, and an Iranian training camp. During the attack, dozens of Syrian surface-to-air missiles were fired. In response, several Syrian air defense batteries were attacked. The IDF Spokesperson’s Office said the Syrian regime is responsible for what is happening in its territory and warned it not to act or to allow other actors in the country to take further action against Israel. “The IDF is ready and alert for a variety of scenarios and will continue to act as necessary to ensure the safety of Israeli citizens,” read the IDF statement. With the presence of Iranian and Hezbollah forces, Israel’s northern front has become the IDF’s number one priority with former IDF Chief of Staff Lt.-Gen. (res.) Gadi Eisenkot admitting that Israel has carried out hundreds of strikes against Iranian targets in Syria. Israel “operated under a certain threshold until two-and-a-half years ago,” when he got “unanimous consent” from the government to change the rules of the game and dropped some 2,000 missiles against Iranian and Hezbollah targets in 2018 alone, he said. Prime Minister Benjamin Netanyahu said last week that Israel conducted airstrikes on Iranian weapons near Damascus airport on January 13 and Russia warned Israel against further strikes near the airport. Syria is therefore on high alert for any potential airstrikes. Nevertheless, daytime strikes by Israel against targets in the war-torn country are extremely rare with the IAF operating during the night. The action in the north didn’t stop after all this. Last night shots were fired across the border at IDF soldiers near the border fence. Thankfully no one was hurt. With all the attention focused on the north, we must not lose sight of the fact that the southern border with Gaza too is not exactly quiet. The violent Friday riots (aka the March of Return) are still continuing with thousands of Palestinians attempting to breach the border and invade Israel. Earlier this week we saw a miraculous event when an IDF soldier was shot in his helmet – but the bullet did not penetrate and the soldier was only lightly wounded, thank G-d. The soldier who was lightly wounded when he was shot by a terrorist from Gaza narrowly escaped death during the incident. The IDF revealed that the bullet struck the officer’s helmet but did not penetrate it, saving his life. He was evacuated to the hospital with light injuries. Shortly before the shooting, terrorists broke through the security fence, sabotaged military equipment, and returned to the Gaza Strip. The IDF responded by firing tank shells at the Hamas position. The Iron Dome missile system was deployed yesterday in Gush Dan in light of security tensions on the Syrian and Gaza borders. However, National Security Council head and former Military Intelligence research division head Maj. Gen. (res.) Yaakov Amidror estimated yesterday that Syria would not fulfill its threats to bomb Ben-Gurion Airport. In an interview with Radio 103FM Amidror confirmed the Syrians had the means to fire at Ben-Gurion Airport, but said the Syrians had a clear interest not to use them. “The Syrians have missiles that can reach Ben Gurion Airport. They have antiaircraft missiles that can damage planes coming out of Ben-Gurion Airport, but the relationship between us and Syria is such that a Syrian attempt would give us permission to strike them so hard that the Syrian regime would be over, so I don’t see the Syrians risking such an incident. The chances that the Syrians would do such a thing seem to me baseless,” he explained. Gen. Amidror is a clear-headed thinker. Let us hope he is right in his assessments. This entry was posted in Defence and Military, Iran, Mideast news, Terrorism and tagged Gaza, Golan Heights, IAF, IDF, Iran, missiles, Palestinians, Syria, terrorists. Bookmark the permalink. Its frightening. Getting worse on all fronts. The Iranians are trying out their muscles since the Americans are leaving. At least Trump is letting Israel get on with what needs to be done. Every time we move Iron Dome to the centre of the country it is followed by attempts to fire rockets there. Given that the Iranian regime is probably dissatisfied with a single missile (that was shot down) as a response to the public battering they took, they are probably preparing a multi-front attack from North and South. This will also be a test of the new Chief of Staff’s mettle. Should they do this, I personally believe the time is now ripe to hit the Iranians in Iran – we have the long distance missiles to do this. They haven’t had to deal with an attack on their territory since the Iran-Iraq war in the 1980’s. This would for sure bring out more Iranians on to the streets demanding an end to Islamist adventurism. And, hey, if it doesn’t, it will change the balance of fear equation going forward. I still think the Iranians are all talk and no play. I certainly hope so anyway. They know they can’t win a proper war with Israel so what’s more likely is that they will support and push Hezbollah to more and bigger attacks. Ditto with Hamas. It will be interesting to see how the new CoS will respond. He’s certainly saying all the right things. Let’s hope he can carry through. “Syria threatening to bomb Ben Gurion Airport in retaliation for the IAF attacks on Damascus Airport…” Hmm, Assad must have decided that he needs an excuse to build a new international airport in Syria to threaten to direct missiles at Ben Gurion. 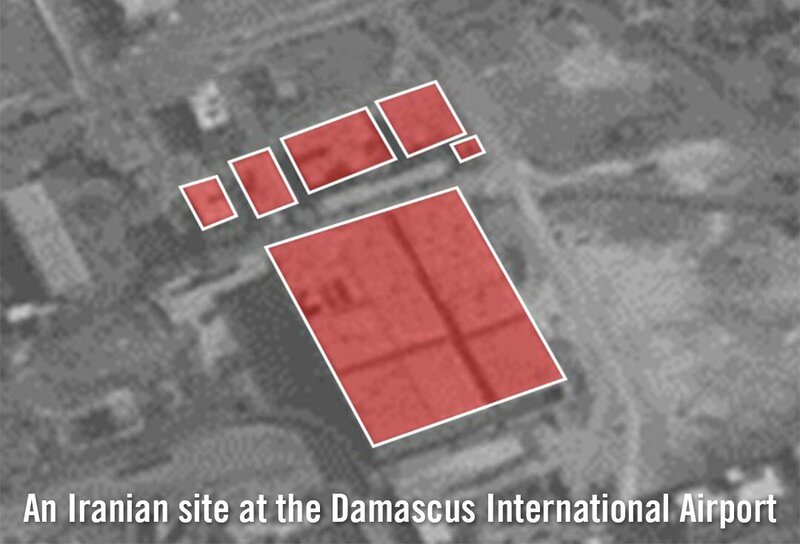 How much time do you think it would take for the IAF to reduce Damascus International Airport to unusable rubble? And Israel has just opened another international airport in the south, near Eilat, just ready for diverted flights! And then Anne says this: “I still think the Iranians are all talk and no play.” For what it’s worth, I agree. There was an analysis not long ago in one of the online papers that the Iranian air force is no match for the IAF (no surprise there: no-one in the region is, which is why Egypt & Jordan signed those peace treaties all those years ago) and talk of the Guard just straining at the leash to get at and destroy Israel is all bluster. Or it is if their generals still have a smidgeon of sanity left. They must know that Israel has nuclear weapons (oops! sorry, tons of chocolate in that secret underground chocolate factory in Dimona) and also has at least 4 nuclear powered and weaponed submarines at sea with enough warheads to reduce Iran to a radioactive desert. It’s not a pleasant scenario (and I wrote about that on this site a year or two back) but it does lend a very scary credibility to “never again”. And I have to add that I scare myself when I realise that I am saying, quite cold bloodily, that I am indifferent to the “other side’s” death rate (let’s call it what it is) provided that “my side” (the Jews of both Israel and the Diaspora) survive and prosper. Hmm… just one little quibble here. That ain’t no chocolate in Dimona. Didn’t you know it’s a knitting factory?? That is what Shimon Peres claimed it was to the mystified Americans. Prime Minister Benjamin Netanyahu told the cabinet on Sunday that he intended to rename the Dimona plant – that a Finance Ministry official told a curious US ambassador in 1960 was a “textile factory” – after Peres. Heaven forfend that such a thing could or should ever be said! Israelis (or at least 80% of them) are also Jews, and our sense of humour (at least for most of us) is world renowned. Fortunately, these days it is much more rarely of the “if you didn’t laugh, you’d cry” variety. I’m happy to say. Still, Anne, are you trying to tell me that no Israelis have a sweet tooth, and there before that all their chocolate has to be imported. I KNOW that chocolate is manufactured in Israel: I’ve even eaten some of it. So if not in Dimona, where else is it made? Or are you going to accuse me, despite being born and bred in the UK and having gone through the UK education system, of having no sense of irony? How dare you even pretend to agree with Corbyn. Now I really AM upset!! Of course you would (and you’d be right to so do), so I’ll leave it there and just have to import my chocolate when visiting! “This article also claims that 50 of Israel’s (presumed) nuclear warheads would be enough to lay waste to Iran (to say nothing of the effect of the radioactive fallout on Iran’s neighbours) and leave more than enough to deter anyone else from wanting to retaliate. Which says nothing about Israel’s 4 (soon to be 5) nuclear armed submarines “submerged somewhere in the world”. This quote is about half way down that article and the original article quoted from is just above the quote. Note my comment at the end of that extract: I’m scared stiff…for non-Israelis in the region. There is no need to apologize for caring more about your own people than for the enemy’s. It’s human nature and sadly the nature of war. This is not to say I don’t feel sorry for them, but I too worry about my own nation and my own family more than the enemy.